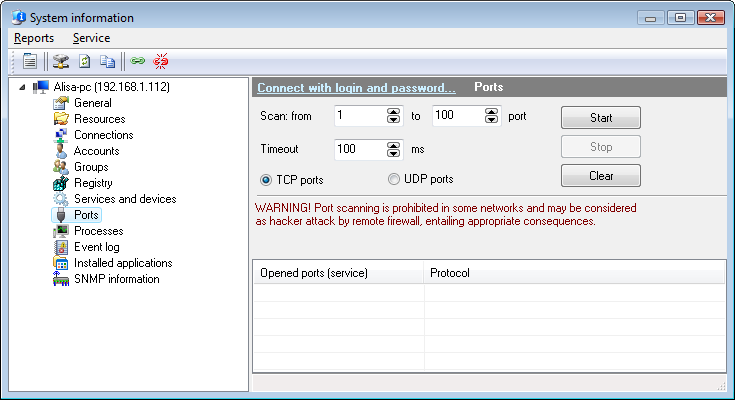 The port scanner will let you retrieve information on ports that are open on the local and the remote computers. The function reads both TCP and UDP ports. Ports of the second type are read much faster than are those of the first type. You may also provide scanning interval (Fig. 1) and time-out – the time, for which the program will wait for response from the remote computer. Fig. 1: Opened ports on the remote computer. You can copy the data you have retrieved to clipboard and then paste it to any text file or Microsoft Excel sheet. To do that, right-click on the service list and then select Copy to clipboard on the menu that appears. IMPORTANT! In most cases, firewall programs treat scanning ports as attack, and that may lead to the respective sequences (you may be banned, disconnected from the network, or punished any other way), for which 10-Strike Software will not be held liable. If you are not an administrator in your network, use this feature on your own risk.